During the week of March 18th, steelhead angler effort on the upper Salmon River began shifting upstream to the Ellis and Challis, ID areas. Effort upstream of the East Fork Salmon River in location code 19 remained light, but anglers were beginning to fish this area. Catch rates from interviewed anglers were better earlier in the week and then slowed down in all areas over the weekend. Anglers downstream of the Middle Fork in location code 14 averaged 10 hours per steelhead caught, and anglers upstream of the Middle Fork in location code 15 averaged 17 hours per steelhead caught. 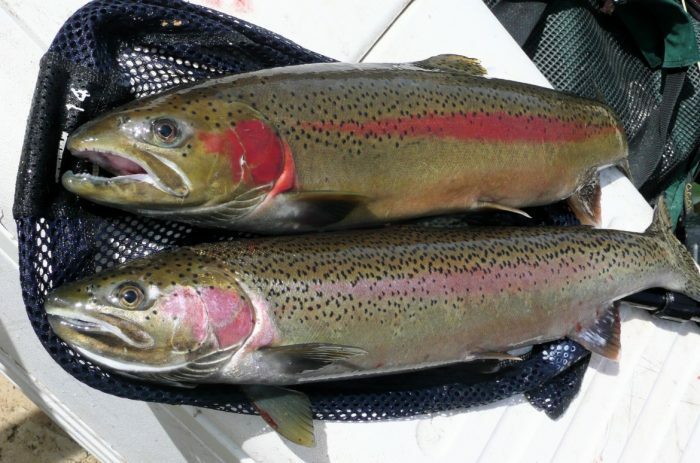 Anglers downstream of the Lemhi River in location code 16 averaged 39 hours per steelhead caught and anglers upstream of the Lemhi River in location code 17 averaged 42 hours per steelhead caught. Anglers downstream of the East Fork in location code 18 averaged 81 hours per steelhead caught while anglers upstream of the East Fork in location code 19 averaged 68 hours per steelhead caught. Currently, the Salmon River is flowing at 1,210 cfs through Salmon, ID which is close to average for this time of year. River conditions slowly deteriorated downstream of Salmon, ID throughout the week and by Sunday, the river was cloudy in all areas downstream of the Pahsimeroi River. Conditions upstream of Challis remained good. Mid-day water temperatures were in the mid to upper 40s. Additionally, as of Monday, March 25th the Pahsimeroi Hatchery has trapped 102 hatchery steelhead.